Seeing the inside of the Sea Lion Caves in the middle of the Oregon coastline is a magnificent sight, like nothing you’ve ever seen before. At the heart is a giant 2-acre cavern 125 feet high, with a couple of entrances, one small one a thousand feet long, and another higher, shorter passage. There’s a third entrance, looking down into it, from which you can see the whole of the cave. 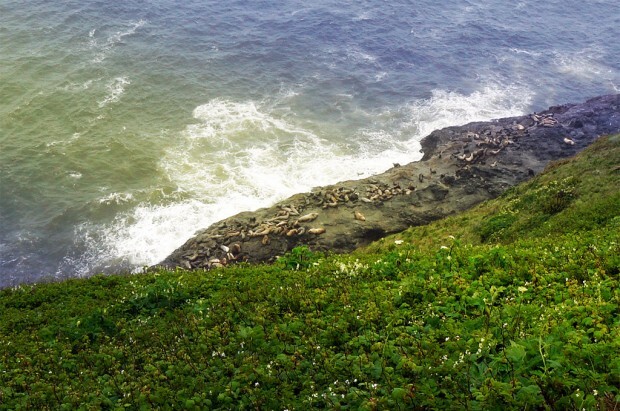 At the best times, you can see hundreds upon hundreds of these sea lions in and around the caves, in the water, and on the sea’s edge. During autumn and winter the sea lions are most often in the cavern, and on the rocky ledges outside during spring time & summer. The cavern walls are covered in algae and lichens, adding an element of color and variety to an already impressive scene. Access to the inside is through the Sea Lion Caves gift shop building, and requires you to purchase a ticket.